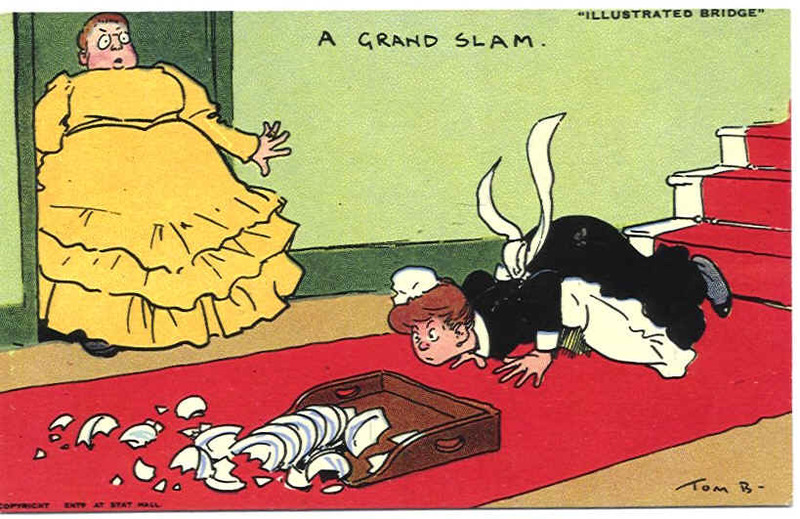 Bridge is the ultimate mind and social game, and comic postcards on bridge by leading artists of the Victorian and Edwardian era, although not as popular as those on other leisure and sporting activities such as cricket and golf, are becoming increasingly scarce, because early comic postcards by popular artists are very collectable, and because it has become very fashionable for devotees of the game to collect bridge memorabilia of all sorts. 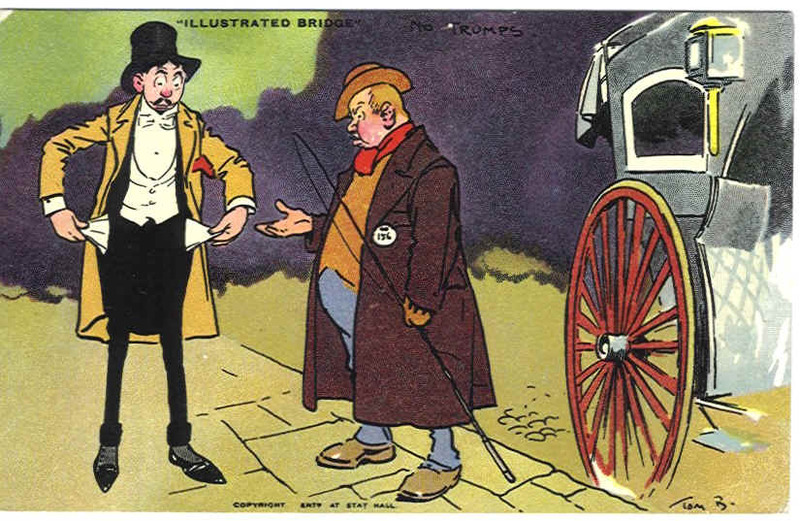 Having played competitive and social bridge regularly ever since my post-graduate days ages ago, my excursion into bridge memorabilia began 10 years or so ago when I spied a set of six good quality Raphael Tuck & Sons Bridge Problems ‘Oilettes’ reproduced in colour from Punch magazine. I just had to buy this set at a BIPEX stand at Kensington Town Hall, and I think I paid about £15. 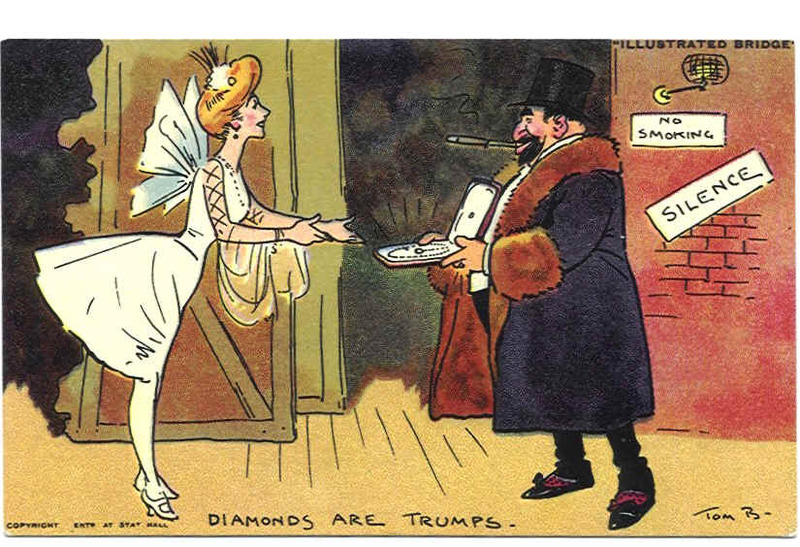 Since then I have been on the trail of bridge postcards of all types with some success, but have yet to come across another such Punch set, though the Illustrations have been duplicated on items such as table mats. Bridge, though not in its present form, can trace its origin to early 16th century in England when prototype forms of ‘whist’ (a call for silence) were played under various names such as triumph. The game was popular under the name of whist by the middle of the 17th century, but it was not until 1742 that the first book devoted to whist, a best seller appeared. 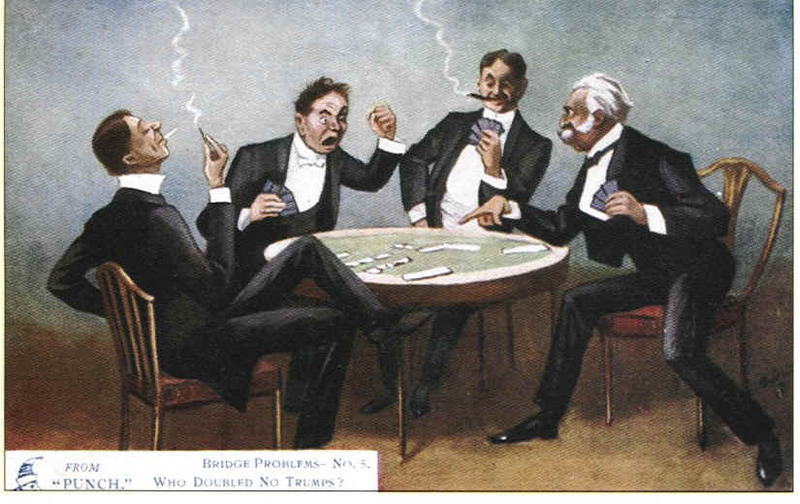 In 1886, a pamphlet was published in England on Russian whist or biritch, which may or may not be the origin of ‘bridge.’ By the turn of the century, bridge had replaced whist as England’s most popular card game, and was first played in London at the Portland Club in 1894. The centenary of bridge in England in 1984 therefore coincided with the picture postcard centenary! 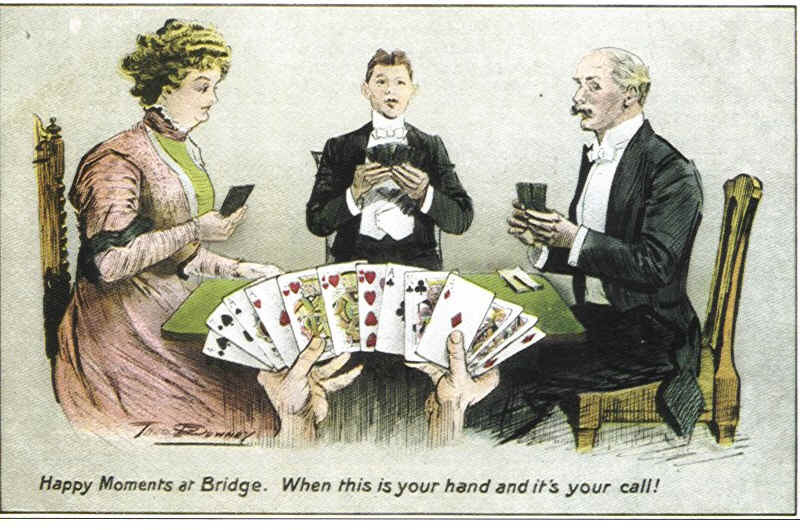 The rules gradually changed, and, in 1904, the game had developed into auction bridge. It was not until 1925 that an American, Harold S. Vanderbilt, introduced his new scoring system and contract bridge, as it is played today, was born. In 1937, the first recognised World Championships took place, and in 1960, the first team Olympiad. Bridge is an intrinsic part of the Mind Sports Olympiad which has been held in London during the past three years, and will be a demonstration event at the 2002 Winter Olympics. There is currently an active lobby to have it declared an Olympic sport. In the early 1990 people started playing on their computers, and with the advent of the internet began just like with the online casino games to go online and play bridge. Now you can play with people all over the world through web conferencing and other online mediums from the comfort of your home, never before has the game of bridge been played by so many different kinds of people. This is a repro of a Red Star Line (Antwerp – Dover –New York) postcard now published by TransAtlantic Research and based on original graphics from the Charles Ire Sachs Collection in the USA. 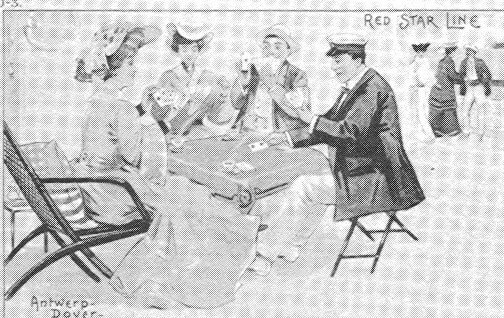 In this 1907 illustration of a bridge foursome on a cruise ship, the guy in the sunhat flashes the ace of hearts surreptitiously to his lovely partner, presumably to indicate his affection for her! Now hosted by well know (and some less well known) bridge players and teachers, bridge on cruise ships have become extremely popular over the past decade or so, with several cruise companies including bridge as a supervised social and learning activity in its brochures, even putting advertisements in bridge magazines. 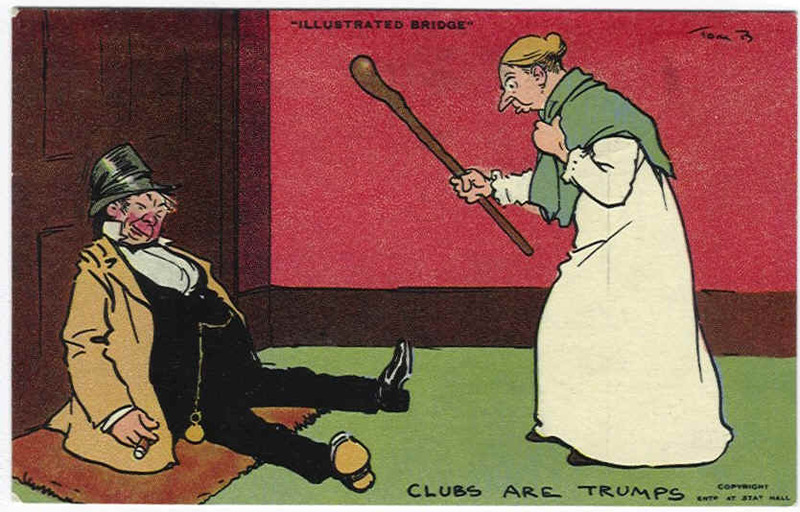 Another card from the Raphael Tuck "Bridge Problems with Punch series titled "Bridge Amenities" and illustrated by Howard Somerville. 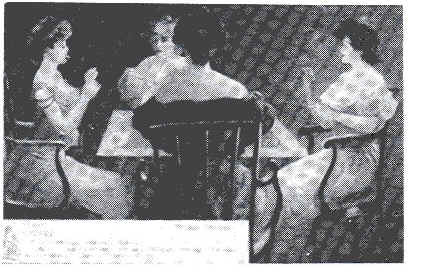 It shows four sophisticated ladies indulging in the following bit of gossip with a cheeky bit of innuendo during play: "Is Florries engaegement really off then?" 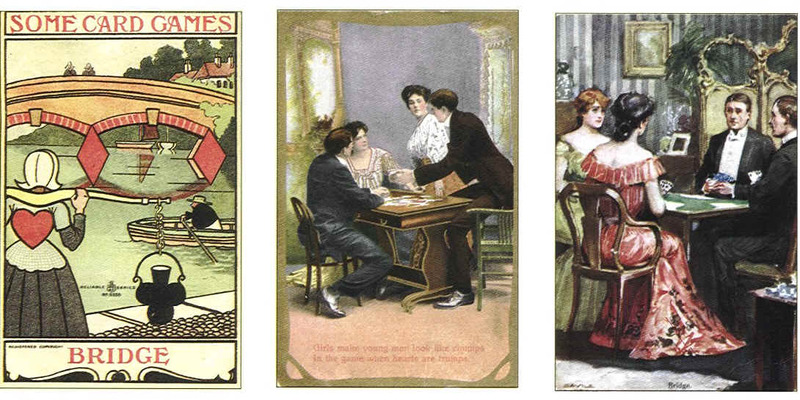 Smoking was clearly very fashionable in those days (nowadays it is frowned upon at most bridge tables) and the tbales pictured on many of the postcards are of good quality and now antiques of great value. (and the author would like to lay his hands on one of these tables - any offers ? This postcard is from the Nostalgia Postcard Collectors Club set and advertises a brand of chocolate, with brief details on the verse on the history of bridge. 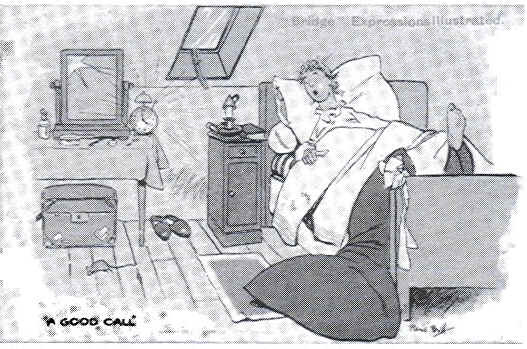 "A Good Call" is one of a set of "Bridge Expressions illustrated" published by Davidson Bros as series 6099. 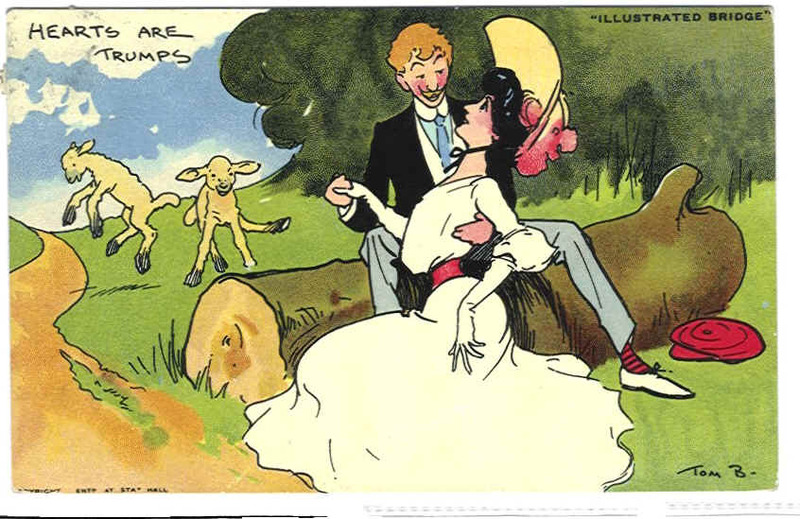 The designs were by Rene Bull (1870-1942). This nseries amusingly illustrates some of the various comments made when playing bridge. 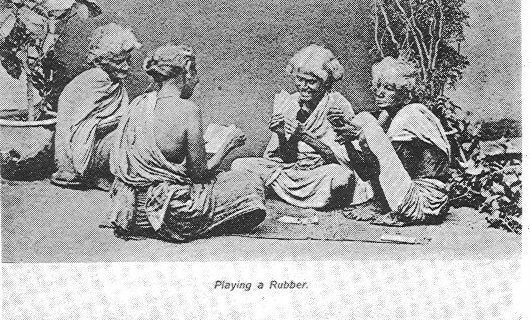 the finely designed postcard illustrated here was posted in Sheffield in July 1904 with the pertinent comment :"Oh dear me-do stop that alarm -am so very tired-think I will wait for the next train"
This is an unknown black and white postcard from a photograph showing four elderly grey-haired Indian women "playing a Rubber". Bridge is very popular in India with the middle and upper classes. 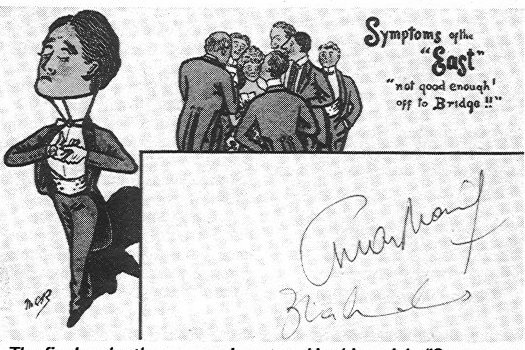 This Oilette card from the Raphael Tuck in the Bridge Problems from 'Punch'" series drawn by L Ravenhill "Who doubled No Trumps ?" shows disagreement on bidding between a pompous and irate pair (while their opponents appear smug) sound familiar ??? This postcard (series2504) published by James Henderson & Sons Ltd London and captioned "Happy Moments at Bridge. When this is your hand and its your call" the artist was Thos Downey and it was posted at Woolwich in February 1911. Would you bid 2C here ? The centre picture shows a postcard printed in Germany but probably of USA origins since it has a NY January 1910 postmark. The pun in the caption "Girls make young men look like chumps, in the game when hearts are trumps" is obviously on the Hearts suit. 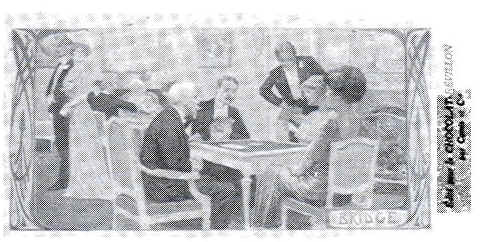 The final picture by the artist Savile in series 526b shows couples playing against each other in elegant dress. Perhaps married couples playing bridge together don't always argue !! 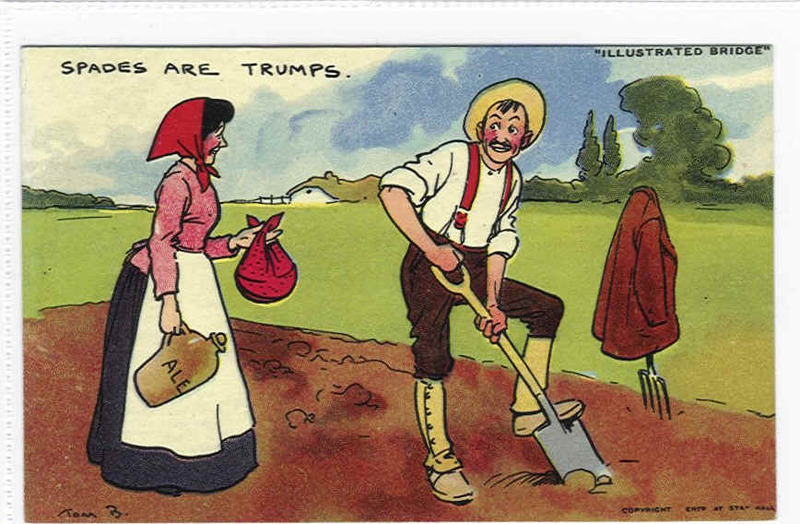 The other cards below are from the same Illustrated bridge Series by Tom Browne and these card are kndly doanted to this page by David Pearlman of London.